There are often excellent rebate programs offered by various industry or governement agencies that are available to our clients that they are completely unaware of. We make it our job to keep up to date on all of these and ensure that you can take full advantage of the savings that you deserve. We'll keep these pages up to date so you are always in the know about rebates that you might be eligible for! You can receive up to $650 in incentives when you participate in the heating and cooling incentive! With as much as 60% of an average home’s energy use going towards heating costs, it makes sense to consider the energy-efficiency of your furnace and central air conditioning units. (vi) the Location must be connected to, or be behind the meter of another electricity consumer connected to, your local distribution company’s (each, an “LDC”) distribution system. (iii) for a replacement furnace, purchase the eligible furnace from and have it installed by a Participating HVAC Contractor between January 1, 2015 and December 31, 2020. 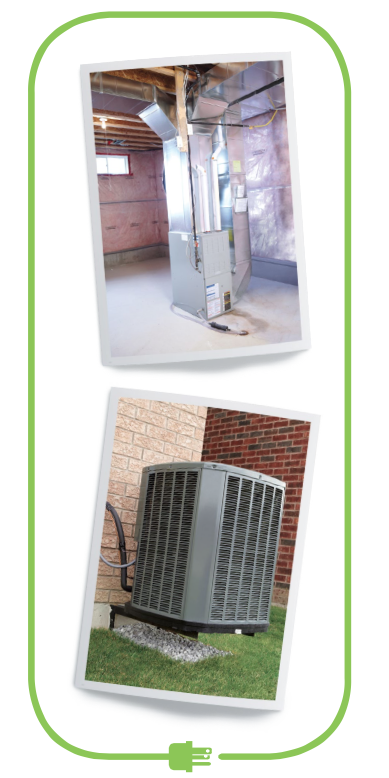 (iv) for a new CAC System installation, purchase the eligible CAC System from and have it installed by a Participating HVAC Contractor between January 1, 2015 and December 31, 2020. (e) For certainty, you may be eligible for one of the incentives set out in Section 1(c) or 1(d) if you meet all of the eligibility requirements set out therein, but not both of such incentives in respect of the same CAC System. Furnaces or CAC Systems that meet the above related requirements are hereinafter referred to as “Eligible HVAC Measures”. YOU ARE RESPONSIBLE FOR ENSURING THAT YOU, YOUR LOCATION OR BUSINESS AND THE EQUIPMENT YOU PURCHASE FOR INSTALLATION SATISFY ALL OF THE ELIGIBILITY REQUIREMENTS. IF ANY ELIGIBILITY REQUIREMENTS ARE NOT MET, YOUR INCENTIVE APPLICATION WILL BE REJECTED OR YOU MAY BE REQUIRED TO REPAY ANY AMOUNTS YOU RECEIVE UNDER THE PROGRAM. By applying for the Program, you represent and warrant that you have met the above related eligibility requirements. You agree that you have independently selected your Participating HVAC Contractor and have done all things that are appropriate to assess your Participating HVAC Contractor’s suitability and qualifications. You have properly contracted for the services and products required, including where appropriate, seeking legal advice. YOU AGREE AND ACKNOWLEDGE THAT THE IESO AND YOUR LDC AND THEIR RESPECTIVE AFFILIATES, EMPLOYEES, AGENTS, OFFICERS, DIRECTORS, SERVICE PROVIDERS OR HEIRS OR ASSIGNS (COLLECTIVELY, “PROGRAM OPERATORS”) MAKE NO REPRESENTATIONS, WARRANTIES OR CONDITIONS, EXPRESS, IMPLIED, STATUTORY OR OTHERWISE, ABOUT THE PROGRAM, NOR DO THEY ENDORSE ANY PARTICIPATING HVAC CONTRACTOR PARTICIPATING IN THE PROGRAM AND MAKE NO REPRESENTATIONS, WARRANTIES OR GUARANTEES AS TO, AND ASSUME NO RESPONSIBILITY FOR, THE CONDUCT, PRODUCTS OR SERVICES OF, OR PROVIDED BY, OR ANY DIRECT, INDIRECT, SPECIAL OR CONSEQUENTIAL DAMAGES, COSTS OR LOSSES, CLAIMS OR LIABILITIES ARISING AS A RESULT OF, ANY PARTICIPATING HVAC CONTRACTOR OR OTHERWISE, INCLUDING, WITHOUT LIMITATION, ANY ACT OR OMISSIONS OF ANY PROGRAM OPERATOR. ALL IMPLIED WARRANTIES OR CONDITIONS OF MERCHANTABILITY, MERCHANTABLE QUALITY OR FITNESS FOR ANY PARTICULAR PURPOSE OR OTHERWISE ARE HEREBY DISCLAIMED. Your Participating HVAC Contractor will fill out your incentive application on-line, however, it is your responsibility to submit your incentive application to the IESO. If you provide your e-mail address, you will receive an e-mail asking you to review the information and confirm that the information set out in the incentive application is correct. If you do not provide your e-mail address, your Participating HVAC Contractor will provide you with a paper copy. You must confirm that the information set out in the incentive application is correct, and you must mail or fax the incentive application to the IESO at the address set out below. Please verify the incentive application information carefully. You may change only your contact details on-line at https://secure.heatingandcoolingincentive.ca/OPA/ConsumerRebateLookup.aspx. Any other information (including your name) in the incentive application can be changed only by contacting the IESO at 1-877-797-9473. 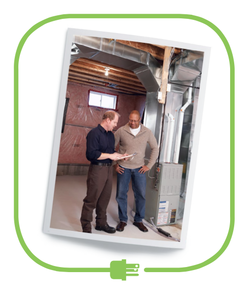 Whether your incentive application is submitted on-line or by mail, you must also mail, fax or e-mail in a copy of your proof of purchase (e.g., a copy of the Participating HVAC Contractor’s invoice), which such proof of purchase will show: the Participating HVAC Contractor’s name, the Ontario address at which the Eligible HVAC Measure was installed, the date of installation, your name, the description, model number and serial number (where applicable) of the Eligible HVAC Measure, the AHRI reference number, if applicable, and the full amount actually paid by you for the Eligible HVAC Measure and installation thereof, all of which must be clearly legible to be valid. If you submit your incentive application by mail, you should submit your proof of purchase in the same envelope. You should keep the original invoice(s) provided to you by the Participating HVAC Contractor in case you need warranty service. Any documentation submitted to the IESO or its agents will not be returned. Paper incentive applications and copies of proof of purchase must be sent to PO Box 10099, Winona, ON, L8E 5R1. (d) all information contained in your incentive application is complete, true and accurate. 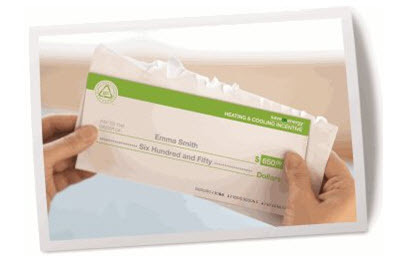 You are responsible for ensuring that your incentive application and proof of purchase is post-marked, or ensuring in the case of an on-line incentive application it is submitted on-line, no later than February 1 of the year after the purchase and installation of the Eligible HVAC Measure. Incentive applications received after that time will not be accepted. The IESO is not responsible for lost, late, or misdirected incentive applications or proofs of purchase. The Program incentives will be issued in the form of a cheque payable in Canadian funds to the participant named in the incentive application and mailed to the address stated therein. Incentive cheques must be cashed within 6 months of issuance. PLEASE ALLOW 8-16 WEEKS FOR DELIVERY from the date you submit your proof of purchase. You may check the status of your incentive application on-line at https://secure.heatingandcoolingincentive.ca/OPA/ConsumerRebateLookup.aspx OR by calling the IESO call centre at 1-877-797-9473. Any misrepresentation, failure to meet the eligibility criteria set out in Section 1 or other requirements set out herein or other breach of this Participant Agreement, or submission of multiple incentive claims or any other fraud will void your participation in the Program and you will be required to repay any amounts received under the Program. This offer cannot be combined with any other offer. All claims are subject to review and approval by IESO or its agent. Late, non-compliant, improperly submitted or incomplete incentive claims, as determined by the IESO at its sole discretion, will be rejected. The IESO reserves the right to cancel the Program at any time at it sole discretion. Incentive submissions for services performed during the term of the Program prior to the date of such cancellation and submitted within 30 days after cancellation of the Program will be honoured. You agree that all right, title and interest in and to all benefits or entitlements associated with decreased environmental impacts now or in the future, direct or indirect, arising as a result of, relating to or in connection with the electricity savings for which an Program incentive has been paid, and the right to quantify and register these, including any energy efficiency certificate, renewable energy certificate, credit, reduction right, offset, allocated pollution right, emission reduction allowance (collectively, the “Environmental Attributes”) are hereby transferred and assigned by you to, or to the extent transfer or assignment is not permitted, held in trust for, the IESO and its successors and assigns. The IESO will be entitled, unilaterally and without your consent, to deal with such Environmental Attributes in any manner it determines. You will indemnify and save harmless each of the Program Operators and their respective directors, officers and employees from any and all liability and all claims, losses, damages (including indirect or consequential damages), expenses and proceedings for personal injury (including death) or property damage of any person relating to, in connection with, resulting from, or arising out of the Program or any other matter contemplated by this Participant Agreement. You represent, warrant and covenant that you will participate in any follow up surveys, studies, audits, evaluations or verifications conducted by the Program Operators in connection with the Program, including for the purpose of proper administration, monitoring and verification of this Participant Agreement or evaluation of the Program, and will provide to the Program Operators reasonable access to your records and premises for such purposes. Except as otherwise provided, this Participant Agreement constitutes the entire agreement between you and the IESO in connection with its subject matter and supersedes all prior representations, communications, negotiations and understandings, whether oral, written, express or implied, concerning the subject matter of this Participant Agreement. This Participant Agreement may not be varied, amended or supplemented except by an agreement in writing signed by both you and the IESO. This Participant Agreement will be governed by and construed in accordance with the laws of the Province of Ontario and the federal laws of Canada applicable therein. This Participant Agreement will enure to the benefit of and be binding upon you and the IESO and the respective successors and permitted assigns of you and the IESO. This Participant Agreement will not be assigned by you to another person. You will, from time to time, on written request by IESO, do all such further acts and execute and deliver or cause to be done, executed and delivered all such further things as may be reasonably required in order to fully perform and to more effectively implement this Participant Agreement. The invalidity, unenforceability or illegality of any provision in this Participant Agreement will not, to the extent permitted by applicable law, affect the validity, enforceability or legality of any other provision of this Participant Agreement, which will remain in full force and effect. The insertion of headings is for convenience of reference only and will not affect the interpretation of this Participant Agreement. The terms “hereof”, “hereunder”, and similar expressions refer to this Participant Agreement and not to any particular Section or other part of this Participant Agreement. Unless otherwise indicated, any reference in this Participant Agreement to a Section refers to the specified section of this Participant Agreement. The word “including” means “including without limitation”, and the words “include” and “includes” have a corresponding meaning. and this Participant Agreement will not be deemed to confer upon or give to any other person any claim or other right or remedy. You appoint the IESO as the trustee for the LDC and the other Program Operators of the applicable provisions set out in this Participant Agreement, including Sections 2, 5, 8 and 9.